City Mazes is a UK based, world leading escape game company. Working with companies such as 20th Century Fox and O2 Priority we have our a-maze-ing branches in Bristol, Cardiff, Oxford, Swindon and London with further cities opening soon. Our creative designers have worked hard to create a pressurised yet ultimately thrilling experience for all, cleverly designing intricate and complex puzzles designed to get your heart rate pulsing and your brain cells buzzing. What exactly is an escape game? Now, a common question asked is ’So what exactly is an escape game?’, and the answer is this: You are locked in a game complex, the clock is set to an hour, and you must work together in a team to solve puzzles and search for clues around the complex to ultimately work out a door code and escape within an hour. At City Mazes, we are leading in next generation escape games, but what is a next generation escape game? This means that anything that you do in the room could affect an item, set off a sound or visual clue or open a lock somewhere else in the room! These actions can be a simple as touching an item or for example, in our New wizard themed game Professor’s Predicament, casting a spell on various items can lead players to many different results…as if by magic! These games allow the greatest level of immersion and excitement as players are not only trying to escape a room but they are involved in the story of the room and affect it by their actions. Our abandoned warehouse themed centre in Bristol consists of ‘The Abandoned Office’ which involves more logical problem solving, the slightly harder ‘Hostage Hostel’, which involves being handcuffed in pairs whilst trying to solve such puzzles and our third brand new complex called ‘Bunker Blowout where you have to blow your way out of Bunker 9! Our huge Cardiff centre, which is of the first of its kind in the local area, also has four massive complexes – ‘Fall In’ & ‘Ice breaker’ and also ‘Bamboozled’ and the brand new ‘Pirates of the Bay’ which are both next generation escape games! Our new event centre in Oxford is now open with four amazing and giant game complexes. London now open with two next generation games – Bamboozled and The Runner. The Runner game even features Augmented Reality! We welcome a wide range of people to come and try our games, from groups of friends, to stag and hen do’s through to corporate team building functions. The games are great fun for everyone, and as a team building exercise you couldn’t ask for more! 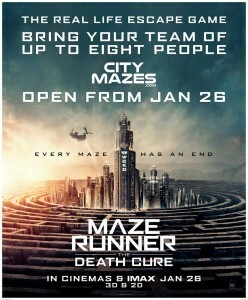 To celebrate the new release of The Maze Runner – The Death Cure, we teamed up with 20th Century Fox and have opened a pop up escape room in Cardiff’s Capitol Shopping Centre. Open for just 28 days, we invite all escape room enthusiasts to attempt to escape!! There is limited time to try out one of Cardiff’s only next generation escape rooms! It’s On Cardiff explain more here!